The turmoil in Yemen grew into a regional conflict today, with Saudi Arabia and its allies bombing Shia rebels allied with Iran, while Egyptian officials said a ground assault will follow the airstrikes. 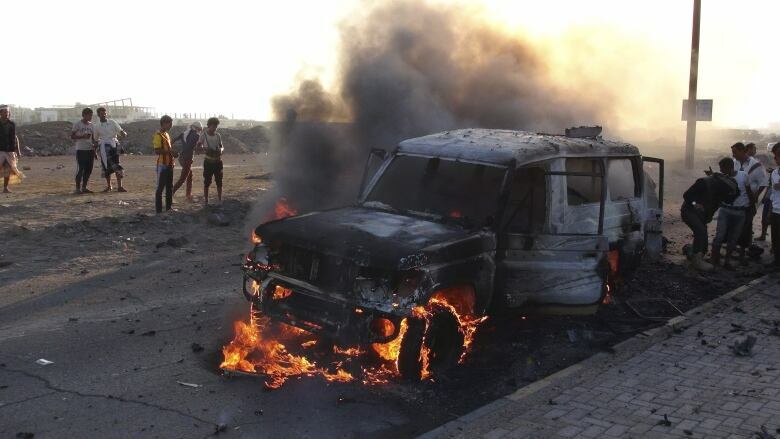 The turmoil in Yemen grew into a regional conflict Thursday, with Saudi Arabia and its allies bombing Shia rebels allied with Iran, while Egyptian officials said a ground assault will follow the airstrikes. Iran denounced the Saudi-led air campaign, saying it "considers this action a dangerous step," and oil prices jumped in New York and London after the offensive. The military action turned impoverished and chaotic Yemen into a new front in the rivalry between Saudi Arabia and Iran. Yemen's U.S.-backed President Abed-Rabbo Mansour Hadi, who fled the country Wednesday as the rebels known as Houthis advanced on his stronghold in the southern port of Aden, reappeared Thursday. He arrived by plane in Saudi Arabia's capital of Riyadh, Saudi state TV reported. Starting before dawn, Saudi warplanes pounded an air base, military bases and anti-aircraft positions in the capital of Sanaa and flattened a number of homes near the airport, killing at least 18 civilians, including six children. Another round followed in the evening, again rocking the city. Rebel leader Abdul-Malik al-Houthi angrily accused the United States, Saudi Arabia and Israel of launching a "criminal, unjust, brutal and sinful" campaign aimed at invading and occupying Yemen. "Yemenis won't accept such humiliation," he said in a televised speech Thursday night, calling the Saudis "stupid" and "evil." 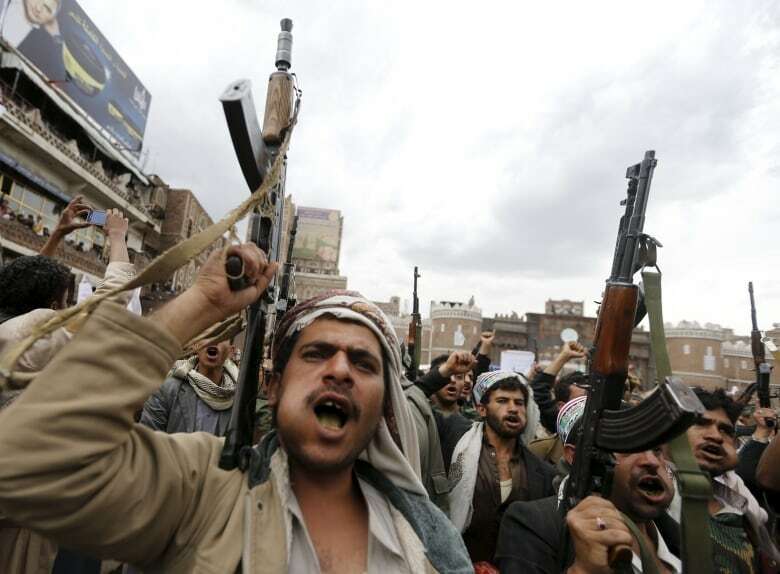 The Houthis, who have taken over much of the country, mobilized thousands of supporters to protest the airstrikes, with one speaker lashing out at the Saudi-led coalition and warning that Yemen "will be the tomb" of the aggressors. White House spokesman Eric Schultz told reporters on Air Force One en route to Alabama that U.S. President Barack Obama had authorized logistical and intelligence support for the strikes, but that the U.S. is not joining with direct military action. In the air assault codenamed "Operation Decisive Storm," Saudi Arabia deployed some 100 fighter jets, 150,000 soldiers and other navy units, Saudi-owned Al Arabiya TV reported. Also involved were aircraft from the United Arab Emirates, Bahrain, Qatar, Kuwait, Jordan, Morocco, Sudan and Egypt, though it was not clear which carried out actual strikes. Once the airstrikes have weakened the rebels and their allies in the military forces loyal to former president Ali AbdullahSaleh, a ground invasion of Yemen is planned by Egyptian, Saudi and other forces. The assault will come from Saudi Arabia and by landings on Yemen's coasts along the Red and Arabian seas, according to three Egyptian military and security officials. Three to five Egyptian troop carriers are stationed offshore, they said, although the number of troops was not specified, and the timing of the operation was not given. The aim is not to occupy Yemen but to weaken the Houthis and their allies until they enter negotiations for power-sharing, the officials said, speaking on condition of anonymity because they were not authorized to talk about the plans with the press. Egypt is "prepared for participation with naval, air and ground forces if necessary," Foreign Minister SamehShukri said at a gathering of Arab foreign ministers preparing for a weekend summit in the Egyptian resort of Sharmel-Sheikh. Saudi Arabia and fellow Sunni-led allies in the Gulf and the Middle East view the Houthi takeover as an attempt by Iran to establish a proxy on the kingdom's southern border. Iran and the Houthis deny that Tehran arms the rebel movement, though it says it provides diplomatic and humanitarian support.